Frankly, though, I’d also heard that the train was usually filled with kids and the idea of a four-hour round trip ride on a train filled with ankle biters just wasn’t that appealing. They tell me the “Polar Express” rides in the winter are the worst for adults (but the best for kids). However, even a normal ride in mid-summer could be trying. Then one day, I saw an ad for an adults-only wine tasting run. As I’ve mentioned here before, I am rather fond of wineries so this opportunity sounded right up my alley. I did a bit of research and a few hours later we had two tickets on the Texas State Railroad. I was surprised when the first wine was brought out. Unlike the little one-ounce tastes you usually get at Texas wineries, these were full glasses. Even more appealing was that along with the wine, we were served a small plate with three different appetizers. Since we had to skip dinner in order to make it to Rusk in time for departure, any food was a pleasant surprise. But the quality—well, let’s just say it was outstanding. We took our time enjoying the food and drink and chatting with the couple sitting across the table from us. It was a thoroughly pleasant setting. About 40 minutes later, we were brought another glass of wine, and another plate of appetizers. Both were even better than the first round. And, as the wine flowed, the conversation got more pleasant. The process repeated again about a half hour later. As we progressed through the evening, the wines got more full-bodied and the appetizers got more substantial. About two hours into the trip the train came to a stop in a small clearing in the middle of the forest. We were told that they were turning the engine around for the ride back to Rusk. While that was going on, we received the fourth glass of wine and the tastiest appetizer plates yet. A little while later (I had now lost track of time), we were on our way back to Rusk and were brought another glass of wine, this time very sweet, and a plate of small desserts. By now people were talking to each other all over the car, not just to those they were seated with. The intimate wine tasting had become one big, jovial party. Finally, the last course was a nice port, again served with a plate of desserts. I don’t have to tell you that the women on the train were ecstatic at the thought of sweet wines and six desserts. When we finally pulled back into the station in Rusk it was 10 p.m. and we had been gone four hours. It seemed like 4 minutes. We had sampled six different wines and had more than a full meal, served in multiple small courses (my favorite way—I love tapas and dim sum houses). Most of all, we had a train full of people who were out to have a good time—and they succeeded spectacularly. That evening in Rusk, we took a train journey to an inconsequential spot in the woods and then returned—and that’s all. But as I was driving back to the hotel, I couldn’t help but be aware that I had just experienced a perfect metaphor for life. 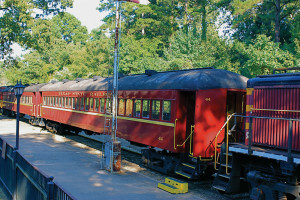 I came to Rusk with a goal—to take a trip on the Texas State Railroad. We left the station with another very specific goal in mind—to travel toward Palestine till we got to the turnaround point and then return to where we started. We met both goals. But so what? Reaching the destination did nothing for us in terms of pleasure or fulfillment. It was no great accomplishment and our lives weren’t changed in any way by that success. Ah, but the journey itself! Now that was a different matter. While the reaching of our destination was entirely inconsequential to us, the true value lay in the journey itself, in the wines, food and conversations that were happening along the way. But regardless of the innate quality in any goal, it seems to me that the anticipation of reaching our goals, and more important, the active pursuit of them, provides far more pleasure for most of us than their final achievement. As a species, we need to have goals to work toward. But it is in the pursuit of those goals that our lives happen. It was in the time spent working toward Palestine, and then back to Rusk, where the real value of this trip lay. In fact, reaching the destinations was anti-climatic. Our lives happen not at our destinations, but rather in the journeys we take to get to them. And it is in our day-to-day lives where we really want to experience happiness, not in those moments of accomplishment. No matter what goals we have, if we aren’t happy striving for them, we won’t be happy achieving them. Thanks for making the journey fun, Michael!